My favorite memories of Easter as a child include singing beautiful songs about Christ’s Resurrection at church (music is another passion of mine), attending the “sunrise service”, and admiring all the beautiful spring dresses my friends were wearing. I also remember the beautiful Bible cover that my mom had. It was blue, with pink and yellow roses; trimmed with lace, and accented with pearl beads–I admired it so much, and longed to have my own just like it! Above all, Easter was a day for celebrating all things new, and spending time with family recounting our blessings. 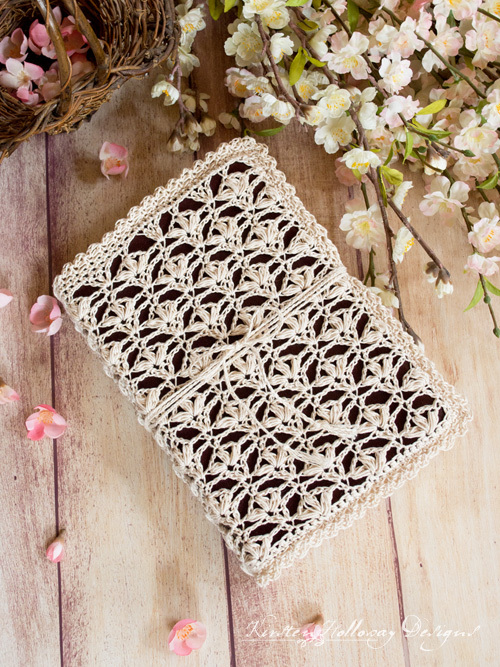 It is in honor of these memories, and the gift of Hope we have because of Christ’s death and resurrection, that this crochet Bible cover pattern came to be. The flower motif, which I originally found instructions for over here, reminds me of lilies which are often associated with Easter, due to the themes of purity and rebirth. Because of that, this beautiful crochet cover would also work for a baby dedication, first communion, or baptism gift. 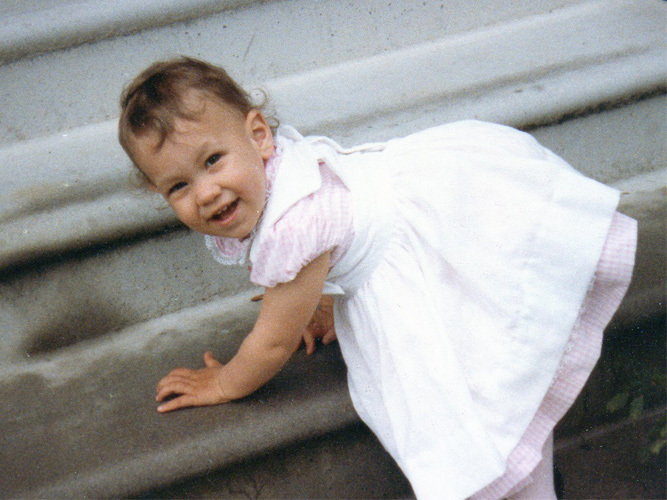 Yours Truly, several years before learning to crochet. I was doing good to walk at this point. 😉 I also didn’t have as many curls. Puff Stitch (abbreviated “puff” in pattern): YO, insert hook into stitch, pull up a loop, YO, insert hook into same stitch, pull up a loop 2 more times. YO and pull through all 7 loops. An assembly diagram is included further down. It is possible to customize this! 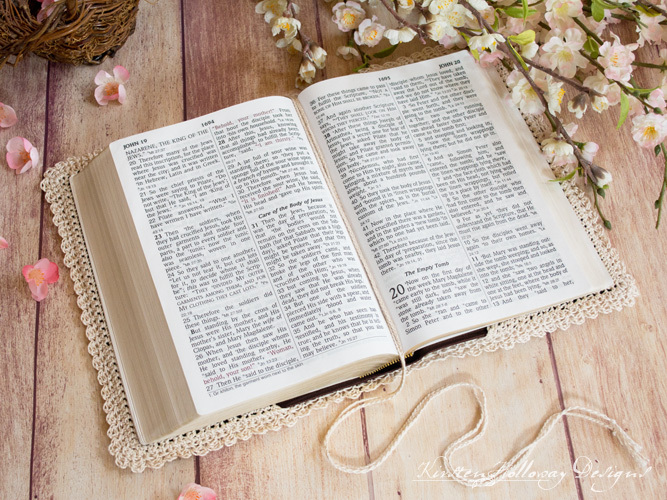 Try a beginning ch of 50 for a smaller Bible cover. Measurements are taken across the back from one end of the cover to the other. The original stitch pattern called for multiples of 16 + 10 for the starting chain, but I have tried multiples of 8 + 10 also, and had it work. The following beginning chains should work with this pattern: 42, 50, 58, 66, and 74. Your piece should measure 13” wide by 2” tall at the shell tops. Repeat rows 3-6 until your cover is about ½” to 1” shorter than the Bible or book you are making it for. Repeat row 3 one more time, then ch 1, turn, and sc in each stitch across (65). I completed 22 rows for my cover. 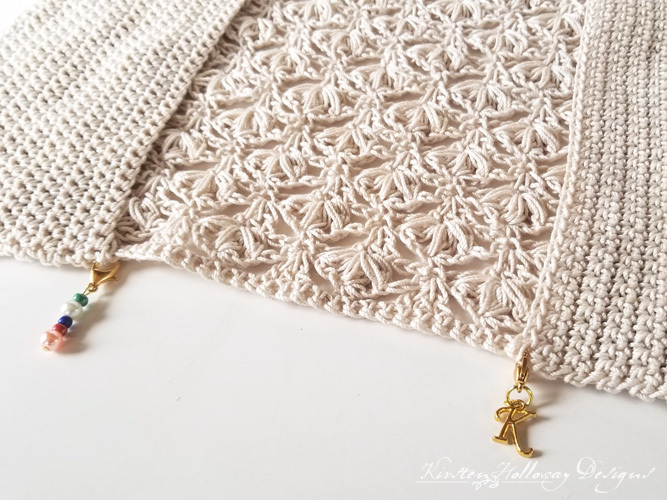 You may choose to block your lace at this point, or place the cover on your Bible after you’ve finished the entire piece and let the book do the blocking for you. If you decide to do the later, the cover will be pretty snug, since cotton does stretch with time. Repeat row 2 20 more times until your panel measures 3 1/2” tall by 9” wide (22 rows). If you want deeper panels, keep repeating until they are as tall as you like. 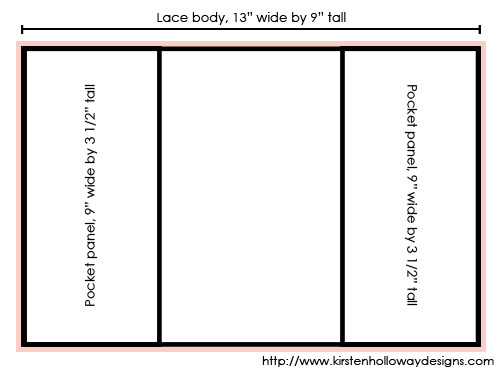 Lay lace body flat, with front facing down. Place a pocket panel sideways over each end, and crochet them together with sc. Put 3 sc in each corner. Continue to sc around the entire lace piece (represented by pink line), attaching the panels on 3 sides as you go. This will create 2 “pockets”. Do not break yarn! Row 1: This border is worked in multiples of 2. If your edge stitch count is not divisible by 2, just put an extra stitch (or subtract a stitch) at the end to make it so that it will be in multiples of 2.
ch 1, sc, ch 2, hdc into side of sc, skip stitch *sc, ch 2, hdc into side of sc, skip stitch* repeat around. Cut 3 6-ft lengths of crochet thread. Braid them together to create a cord. Knot the ends. Fray ends. Attach cord to back of Bible cover so it doesn’t get separated. The cord can be used as a book mark while reading. Feel free to make it shorter if you prefer. Use this cord to wind around your Bible and cover. Tie in a bow or knot. Friends, if you enjoyed this pattern, don’t forget to sign up for my newsletter, here! That way you’ll never miss out on special events, or freebies I’m offering. Oh, I do love this, and have bookmarked it so I can make several for gifts, and a couple for my own Bible. Thank you so much, and Happy Easter to you and yours! Happy Easter to you too, Becky! Happy crocheting! Thank you for this beautiful pattern and the clarity of instructions. You’re welcome, Marceline! Enjoy making it! That’s a wonderful idea! I am sure they will appreciate your gift! 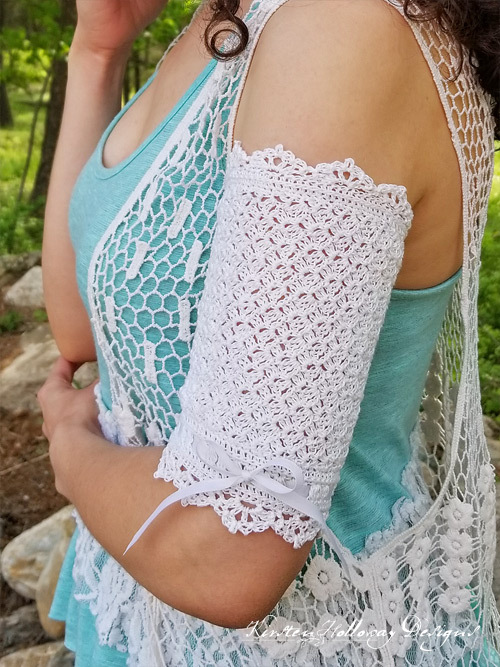 I love this crochet pattern!! I am somewhat of a beginner as I don’t know that many stiches. Been crocheting for several years. Just afraid with each new stitch, I get scared. Plus I’ve haven’t tried to use thin thread on a project. I have a question though. I used the same size 3 fashion thread and same book, but when I finished row 8 the piece was only 9″ wife and about 2″ tall, no where near the 13″ mentioned. Am I possibly doing it wrong somehow?